Ash Wednesday is traditionally observed by a number of Christian denominations. Catholic ritual and theology shows the role death can play in the path towards immortality. Along the way, I learn more than I expected about a ritual I actually practice, and come up with an idea for next year's hottest new app. Catholics are certainly not the only group of Christians that observe Ash Wednesday. Many other Protestant groups, such as Lutherans, Methodists, Episcopalians, and Anglicans, observe this day, and the practices are generally the same. I focused on Catholics just to narrow the scope of the episode. As I discovered, the answer to ‘What is Catholicism?’ is not always as simple as you think it might be. I certainly took for granted that I understood the religion I was raised in. So let’s start with some nice overviews. Here is an introduction to Catholicism by Boston College, another Jesuit school. And if you’re just looking for more information about Ash Wednesday, Wiki is never a bad choice. The article covers a lot I didn’t get to in the episode, like non-Catholic traditions and variations in the ritual throughout the world. Alternatively, here’s the description of Ash Wednesday from Catholic.org. This is what your Ash Wednesday cross looks like. The ending of the episode wasn't just for dramatic effect. I can't tell you how many times I've accidentaly started to itch my forehead and then realized I had ashes there. Catholic theology has been around a long time. There is way more out there than I can fit into the shownotes. It’s an enormous task to even begin deciding who the ‘most important theologians’ in church history are. But here are some jumping off points. If you like your theology essential but approachable, check out Augustine’s Confessions. If it were on a syllabus of yours in college, but you just skimmed the Sparknotes, do yourself a favor and really read it. Loyola has a great reading list of Catholic classics, if you’re looking to delve further into theology. They’re separated by period, so you can choose to delve into some of those medieval thinkers who shaped the modern church. 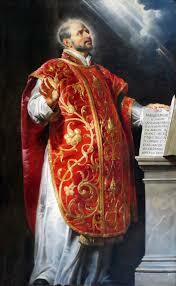 This is St. Ignatius of Loyola, founder of the Society of Jesus, aka the Jesuits. He's one of the most influential Catholic thinkers of all time. If you liked with Father McDermott had to say, I strongly encourage you to check out the Society of Jesus and Ignatian Spirituality. If the question you’re still asking is ‘what is a Jesuit’, start with my old friend Wikipedia for a friendly overview of Ignatian spirituality. Then move into what the Jesuits have to say for themselves. In general, the Jesuit website is a great resource -- they point you towards tons of useful information. Here’s a nice, succinct collection of letters by Ignatius, each prefaced by an introduction. He wrote a lot, and his spiritual exercises have helped many, many people. If you’re really serious about learning more about Ignatian spiritualism, I strongly suggest you ask someone how knows more than me. All I’m good for is quips. Here’s an article from the Chicago Tribune where you can learn more about the glitter/ash thing in Chicago. Incidentally, ‘glitter/ash’ is also the name of my Kesha inspired electro-folk album. I think I absolutely would have gone the glitter/ash route if it was available in D.C.
During Holy Week (the days leading up to Easter) many towns in southern Spain perform massive solemn parades. The usually include floats that call to mind scenes of Christ's crucifixion and involve elaborate costumes. One other thing I encountered while I was looking for actual information about D.C/ churches was Ash Wednesday Yelp reviews. In retrospect, I’m not surprised they exist. I’m sure your local city has them, too.